SimilarWeb, owned by Israeli start-up SimilarGroup, is an online competitive intelligence tool that provides traffic and marketing insights for any website. 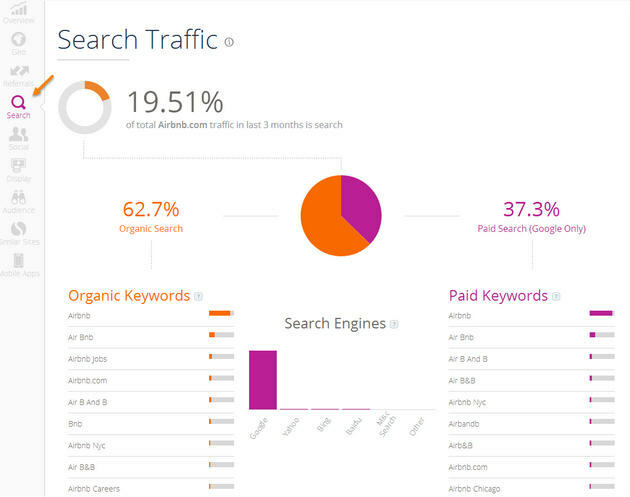 The tool provides users with a quick overview of a site’s reach, ranking and user engagement. Users can search for data by entering a specific website URL or by running a category search by industry or country, where the top 50 websites are displayed. SimilarWeb transforms raw data into engaging and insightful website metrics, including traffic sources, organic versus paid search, social traffic, related sites, and more. 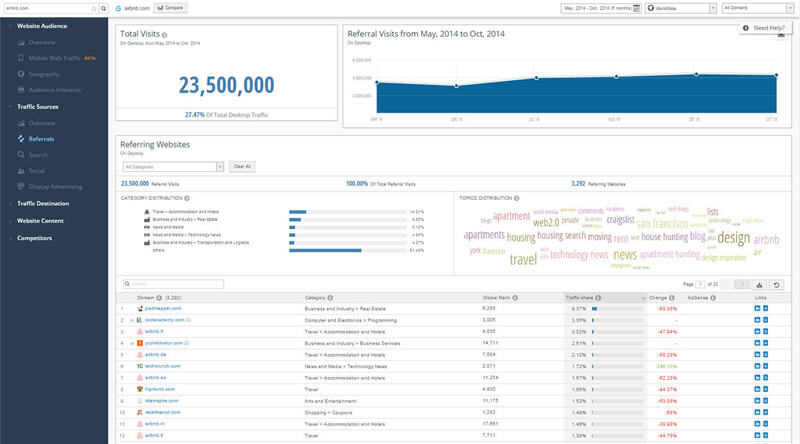 In its default view (audience overview), SimilarWeb presents website traffic for the past six full months. 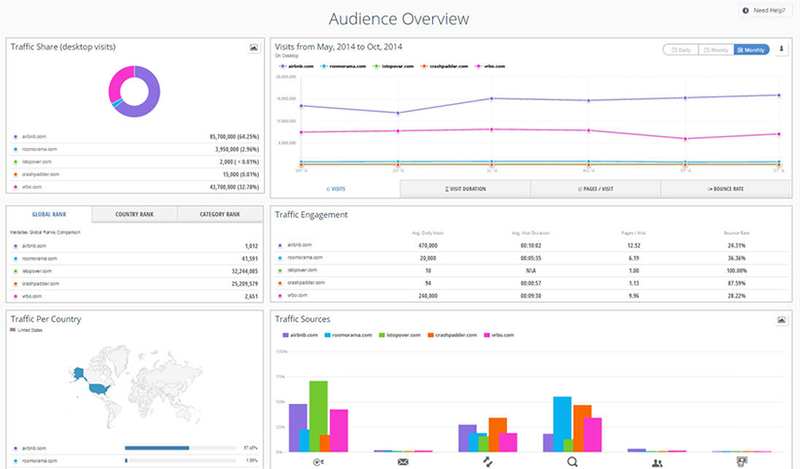 It displays Global, US and category rank and snapshots of audience breakdowns by countries and traffic sources. 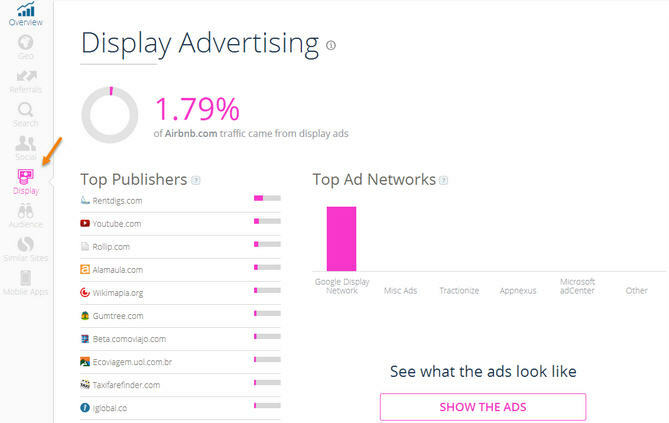 SimilarWeb offers a rich visual dashboard with a wealth of data divided into General Overview and eight other metrics: Geography, Referring Sites, Search Traffic, Social, Display Advertising, Audience, Similar sites and Mobile apps. The free version enables comparison of up to 2 websites side by side. In the PRO version, a comparison of up to 5 sites is available. Website rank: estimate of a website’s popularity among other websites. Traffic estimates: monthly visits (last 6 months). Engagement: time on page, page views. 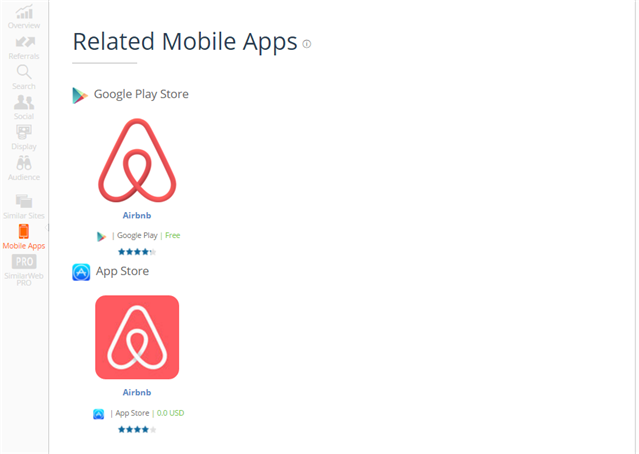 Displays the mobile apps belonging to the website. 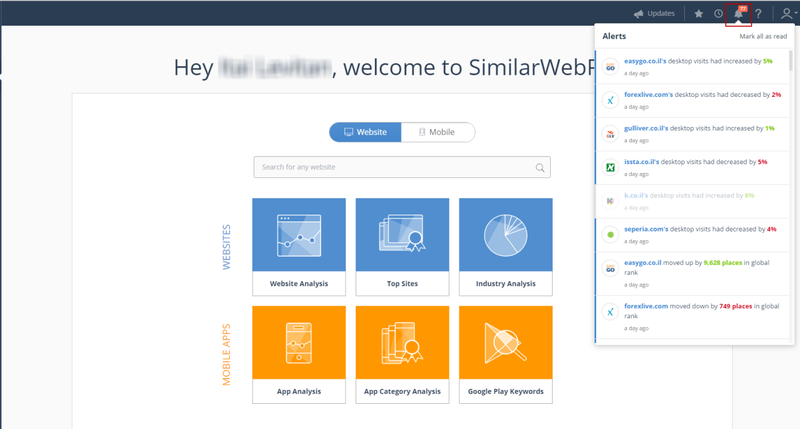 A free version of SimilarWeb is available (sign-up required), enabling users to get a feel for the tool with limited access to the PRO tool’s features. The free account offer 5 results per metric, 1 month of mobile app data and 3 months of web traffic data. Speak to a SimilarWeb representative for pricing details of the premium plan. Through the PRO packages, your data can be exported to Excel. The Advanced and Ultimate packages also offer industry analysis data not available in the Basic and Free packages. 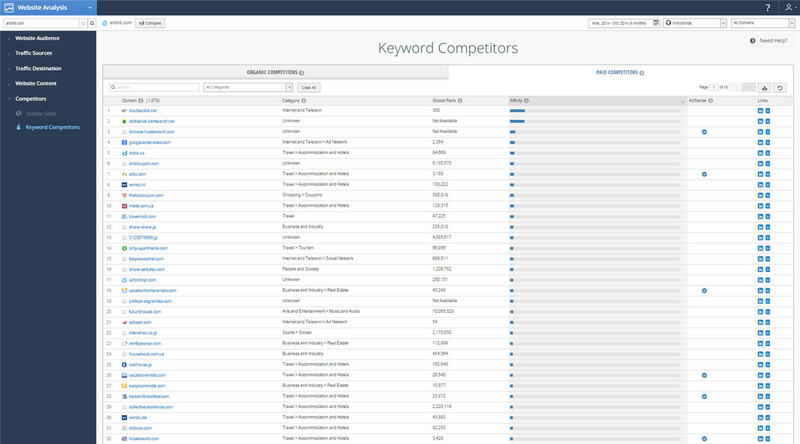 SimilarWeb also provides paid custom reports, based on user needs and preferences. 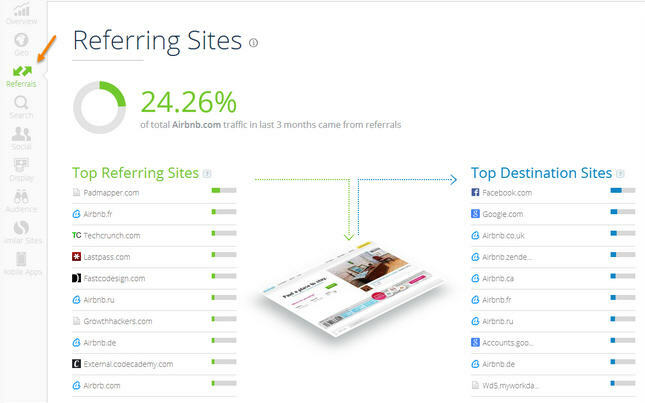 SimilarWeb enables you to save site reports and receive weekly updates about them. The alerts will appear on your user dashboard as well as be sent directly to your e-mail. You can set alerts to show metrics from within the website reports including changes in: desktop visits, global rank and referral traffic and keywords trends. Users without a subscription can download a full PDF report, which is sent to your e-mail (you can’t download it directly through the website). The report is basically a screen shot of the website report. You can also receive the code for the estimated monthly visits and the traffic sources graph to embed them on your own website. Download all graphs and charts as an image (PNG). Download three sections of data: Website Referral Traffic, Search Terms and Popular Words (within the search terms tab) and export it to Excel- this is an important feature that enables you to manipulate and create your personal reports in Excel. As is expected from a leading online company, SimilarWeb has taken a major step into the mobile arena. Their tool offers in depth mobile app analyses that present valuable insights about your mobile app, allowing you to compare your app with other apps in the same industry/category. Some of the mobile features are in Beta version or limited for Android apps but the logic behind them is clear- mobile traffic is equal to desktop traffic (or even bigger in some verticals) and should be treated and measured as such. Ranking and Rating- rating based on audience reviews, installation numbers, app category ranking and top free category ranking. App Engagement- engagement metrics and user behavior habits and lifespan (only for android apps). 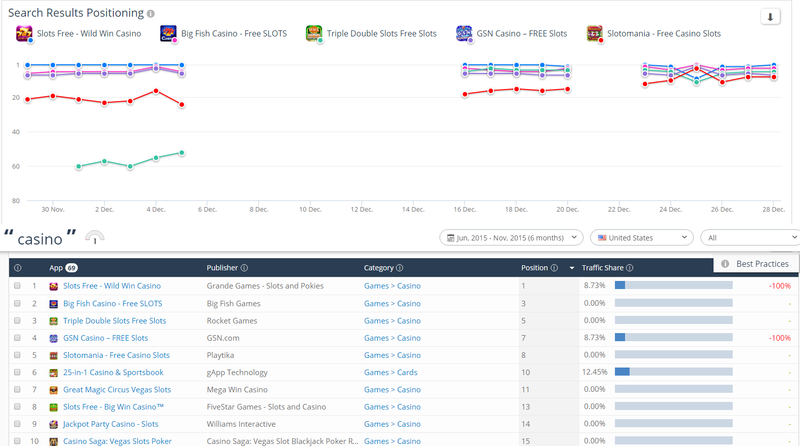 Another nice feature on the app analysis dashboard is the Apps on fire that show the top 5 Android and iOS apps by rank improvement (free apps in the US). SimilarWeb has its own App index-a ranking algorithm based on the number of app installs and the number of daily active users measured by SimilarWeb. You can also choose to use the Google Play store rank. The results you will get are different, which makes it a bit confusing but it’s always better to get more than one indication, especially when the data is related to traffic and user behavior measurement. Users who want to generate traffic to their app through the App store will find the top keywords feature and Google Play keyword analysis very useful. 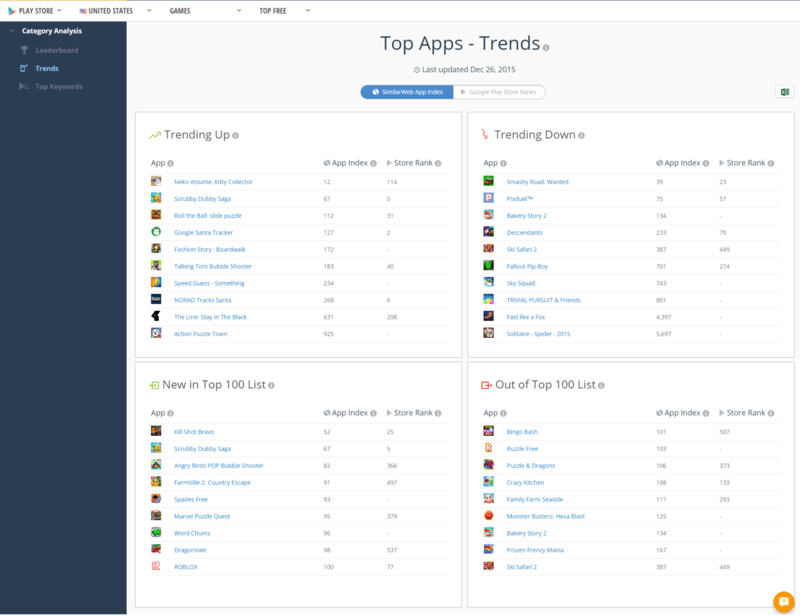 It enables you to get a list of apps that ranked for specific keywords- a good start if you are looking to build an ASO campaign. Pro users can export the data to Excel. In the image below you can see results for the keyword “casino” in the US, Jun-Nov 2015. SimilarWeb collects data via two distinct sources: their user panel and a web crawler. According to SimilarWeb, they possess the largest panel in the world for web measurement, which is highly represented in Europe, North America, South America, and APAC. Their clickstream data is also collected from users who have downloaded their free browser plugins, add-ons and apps, and opted-in anonymously. The SimilarWeb widgets (Website Visits, Traffic Sources) and browser extensions for Chrome and Firefox allow users to see basic site metrics on the go, as they actually visit a particular site. 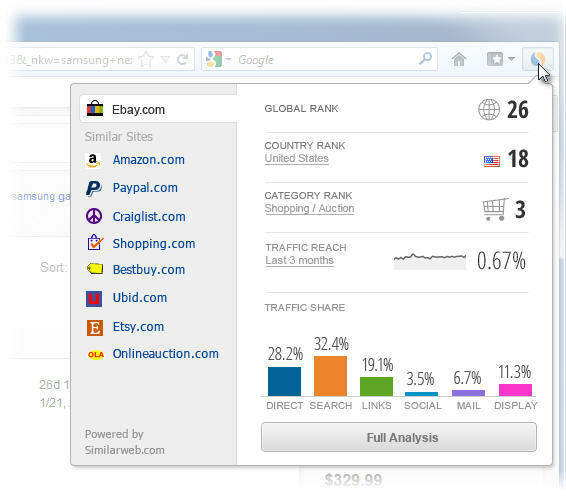 The browser extensions provide users with 10 SimilarSites options, website rank, traffic sources overview and a button that links to a full analysis on the website. The Chrome extension currently has 63,858 users and the Firefox add-on boasts 4,653,633 downloads. Users who have downloaded the extension automatically join SimilarWeb’s user panel; their online activity will be tracked and their browsing data will contribute to the poll among other users that run SimilarGroup’s plugins such as the SimilarSites toolbar and SimilarSites extension. SimilarWeb Toolbar: SimilarWeb add-on for Firefox: SimilarWeb Widgets: Designed for websites, these widgets can be displayed on any site wishing to show its visitors dynamic visits trend, or its main traffic sources. We at Seperia, matched SimilarWeb data for accounts where we have actual traffic data through Google Analytics, to conclude on its accuracy levels. According to our tests, it seems that SimilarWeb’s data estimates tend to be more accurate for websites with more than 50K visits a month. For sites with less than 50K monthly visits and complex sites with a number of subdomains, we noticed a greater deviation between SimilarWeb’s and Google Anlaytics’ traffic reports. In most cases the SimilarWeb estimation was higher than the actual traffic measured by Google Analytics. On the other hand, our tests also revealed that SimilarWeb’s estimation of traffic distributions between different sources tends to be accurate. Our tests suggest that SimilarWeb’s results offer a solid indication of websites’ proportions and traffic trends overtime. Comparing different websites’ metrics will give you a pretty good indication about their traffic size, trends over time and sources. In certain cases, caution may be necessary when seeking exact site visits data, but you will still be provided with a reliable scale for measuring and comparing websites. Digital marketers can use this tool for many marketing activities including benchmarking, discovery of potential traffic sources and more. Business analysts can use this tool to monitor and benchmark competitor activity. 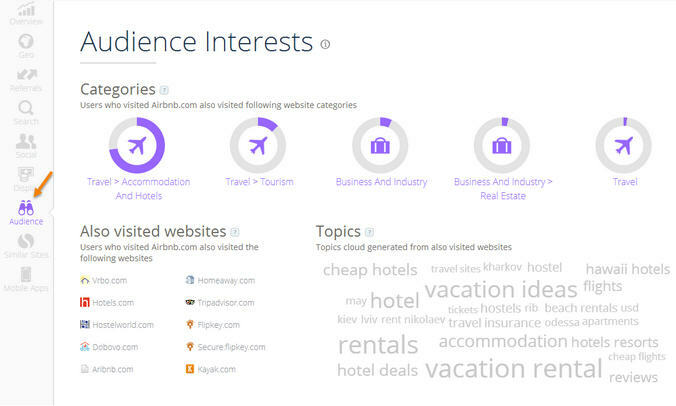 Bloggers and site owners can use this tool to discover their business landscape. 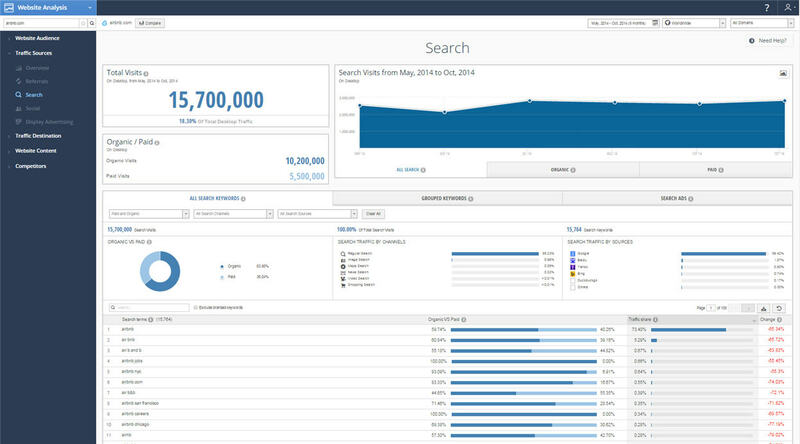 SimilarWeb offers a satisfying user experience, and looks fresher than the old-fashioned interface of Alexa. The dashboard is intuitive and easy to use; it provides clear visuals of the data with charts, images and lists that make the information clear and simple. Each topic has a clickable info button and every subtopic contains info about the data. The add competitor button offers auto completion and each topic contains relevant links (referrals, google SERP, competitor websites Etc.). The tool is also quite fast. 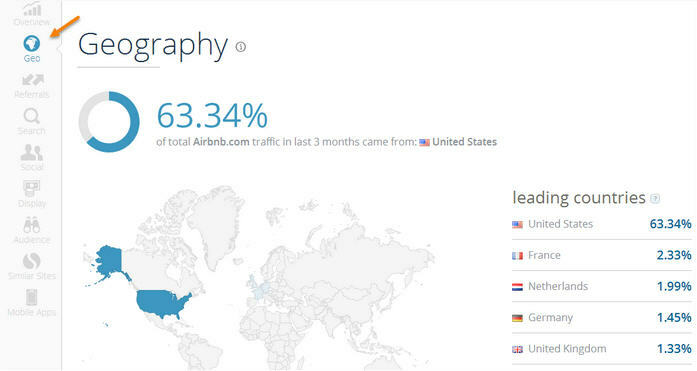 Global data for users outside the US. Displays a comprehensive and useful general overview. Large scale of data, including: visits, traffic sources, audience metrics, search data, social media, geo distribution, mobile apps, and more. Provides organic keywords (collects “not provided” too). Ability to export reports (only in PDF in free version). Traffic estimates are set to full months only; it’s impossible to set specific date ranges (in free version). Estimates only desktop traffic without mobile and tablets. Traffic estimates should be treated carefully, especially with smaller websites. If you are a site owner or an online marketing professional, SimilarWeb can provide competitive intelligence on your industry and main competitors. It enables you to learn what your competitors are doing, benchmark their performance and get a sense of your business landscape. For campaigns measurement and advertising decision making based on traffic size and conversion rate, you should pay close attention to the data estimates provided by SimilarWeb and decide whether or not they make sense compared to accurate data you get from Google Analytics for example. With regards to audience geo profile, if you are interested in measuring worldwide traffic, SimilarWeb may be your best choice. Finally, when it comes to evaluating the percentage breakdown different traffic sources are driving to the analyzed site, SimilarWeb delivers a fairly accurate estimation. All in all, SimilarWeb is a must have for “heavy duty” online marketers. 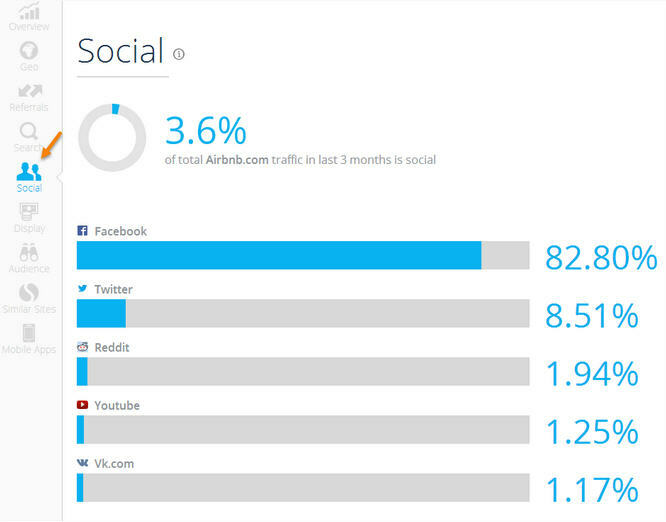 Do you use SimilarWeb? Tell us about your experiences with this competitive intelligence tool.